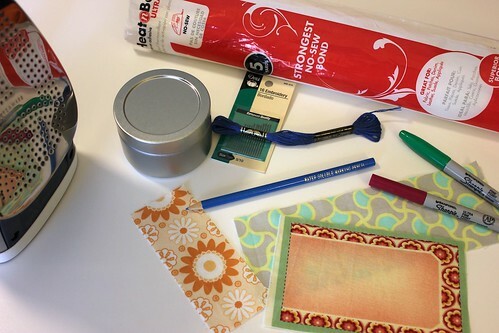 Do you like to attach a name to stuff, or are you a non-committal type? I’ve always been one to put a label on things — at least in the literal sense. 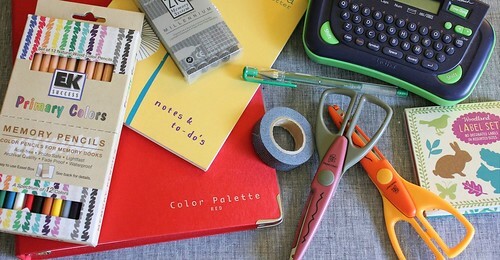 ;-) I think it goes hand-in-hand with my lifelong adoration of all things office supplies. I use a lot of glass containers. I know what they’re made from, and I can pronounce it. I can see how much is left of whatever is inside. I don’t worry about heating or freezing them. They can be used more times than your favorite excuse without staining or declining in quality — some of my favorite ones are older than I am. The only thing I have found less than desirable up to this point was their label-friendliness. Masking tape labels are kinda ugly. Paper sticker labels don’t hold up to washing and are sometimes difficult to remove. I was seeking a solution that was durable, flexible, and perhaps most importantly, cute. If you’re me and you want to make something aesthetically pleasing, your thoughts go immediately to fabric. But… but… how… and what about… and doesn’t it… Such are the thoughts that kept me from trying fabric labels on glass for over a year after having the initial idea. And yet, when I finally did it, it worked perfectly the Very First Time. *For permanent labeling, you can use hand embroidery or free motion machine stitching, a sharpie or some other kind of permanent or fabric marker, another scrap of fabric for appliqué, and I’m sure there are tons more options I’m not considering. Basically, you want it to withstand getting wet, hot, frozen, etc. 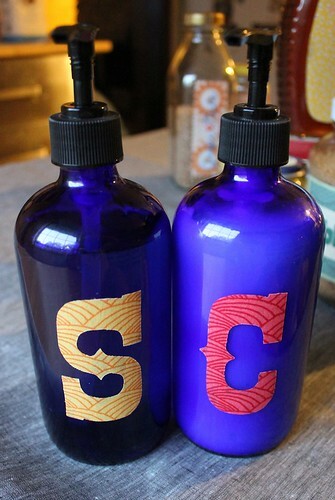 For temporary labeling, you can use chalk, pencil, or water soluble marker. Cut your fabric a bit larger than the area you measured — 1/4″ or so all around should do it. 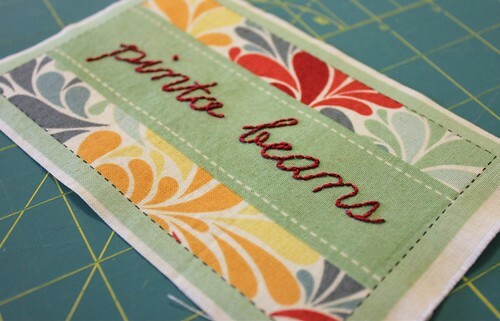 Next, if you plan to machine- or hand-stitch the label, do it now, before applying the adhesive. When this particular strain of Heat’n Bond says No-Sew, it means it. I stitched the pinto beans label after attaching this stuff and seriously? Embroidery shouldn’t require such exertion. 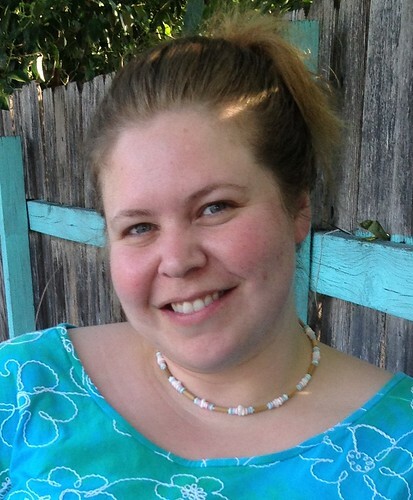 I guess I should have interpreted the No-Sew as more than just a suggestion. Cut a piece of the Heat’n Bond a little smaller in width and height than your fabric, then position it on the back. Make absolutely sure to leave a little space around the adhesive on each side! Without fabric covering it completely, it would make a helluva mess on your iron or ironing board. Adhere adhesive to fabric, following manufacturer’s instructions. 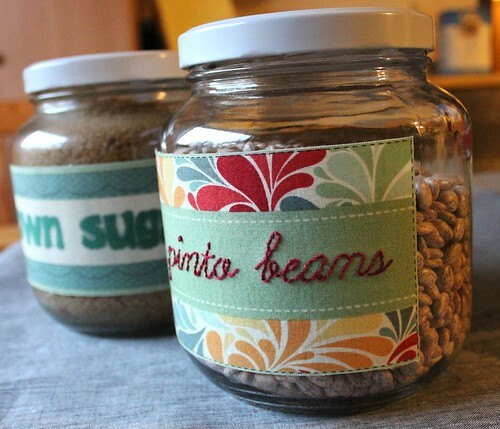 Remove the paper backing and position the label onto your jar, smoothing it out. 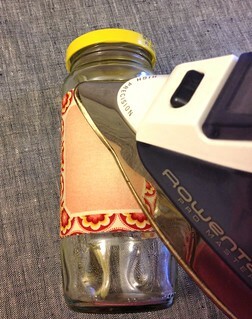 Lastly, iron the label to the jar. My package of adhesive said to do this final step for 8 seconds with a dry, medium-heat iron, so I just kind of rolled the iron slowly along the label. This takes a couple of minutes because the iron can make contact with so little of the jar at once. When you’re confident that it’s affixed, go over it one more time, making especially sure that the edges of the label are adhered well. That’s all there is to it! I’ve repeatedly washed these jars (by hand, haven’t tried the dishwasher) without the label jumping ship. So the next time you have a jar that’s asking exactly what it is to you, step up. Label it. Love this! So cute and useful. Good one Susan!